Do you have bad spots or stains on your carpet in Birmingham AL? If so, Heaven’s Best Carpet and Rug Cleaners can help. We have specialized cleaning solutions for almost any spot or stain you may have from pet urine stains, to red wine stains, to black greasy dirt. If you have spots or stains that you have tried to clean, but they keep coming back, here are four reasons the spot may be returning. 1. Consider the source If you have tried to clean a spot and it reappears after cleaning; it may be that the source of the spill has penetrated so deep into the carpet it is hard to get out. If you are only cleaning the top of the stain and the source is still trapped deep in the fibers and the carpet pad, it may not come out. And, every time you spray it with a cleaning product or wet it, it can cause the spot to come back. This happens because the stain has soaked so deep into the carpet it needs professional extraction equipment to remove it. If the stain is never fully extracted and it is only cleaned from the top of the carpet and fibers, every time it is re-wet it will reappear because it has not actually been removed. Common examples of this type of stain are pet urine or oil spills.It is important for customers to inform us that a deep penetrating spill has occurred and where, so we can use the proper equipment to remove it. Otherwise, an unknown stain may reappear. 2. Improper cleaning Improper cleaning procedures can cause spots to come back. This happens if a cleaner or spotting solution has been applied, but is not properly removed or extracted; it can create a stick residue. When this occurs, it may not be the original stain that is showing up again, but the sticky residue has attracted new dirt and is causing re-soiling of the area. 3. Sticky spotsThere are some spills and products that in and of themselves are not visible, but are sticky and collect dirt. The visible spot is not the original spill or product, but because it was sticky it has now attracted soil and dirt and continues to look dirtier and dirtier. Here again, an unknown spot may reappear if the actual sticky stain is not entirely extracted or removed. Informing us of possible sticky stains will help up to better clean your carpets. 4. New spillsIn some cases, the original stain may not be the cause. What gives the illusion of a returning spot is actually a new spill.Consumers often cannot account for what caused the original spots. It is possible to clean the carpet properly and still have the source of the spots continue to produce new ones.A common example of this is when a child wanders the house dripping apple juice on the carpet. The apple juice spills are not detected, but over the next few days dirt from dust in the air or from shoes will bond with the sticky drip spots and become noticeable. Regardless of your spot or stain, Heaven’s Best Carpet Cleaning of Birmingham has professional strength cleaning solutions to get just about any stain out. If you are not sure how to get rid of a tough spot or stain, don’t worry; just call Heaven’s Best at (205) 618-9150. We will come out and analyze your stain, recommend the best treatment, and give you a FREE ESTIMATE. Most spots and stains will come out with our strong professional cleaning enzymes and solutions. And, along with cleaning well they smell great and are environmentally safe. 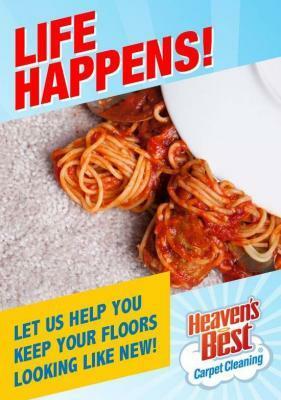 Contact Heaven’s Best for all your carpet spot cleaning needs in Birmingham AL.